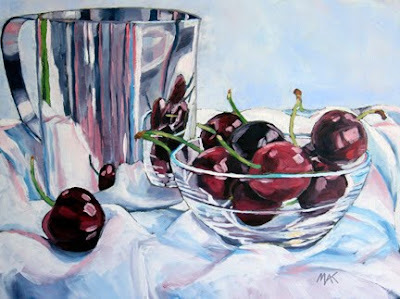 I don't know what it is, but the combination of the white cloth, cherries and reflection in this made it very enjoyable to paint. Simple pleasures! Love this! Great job with the reflections, and the colours are great. Great reflections and colors. I like the subtle background tones against the strong reds and purples.